So here is my *very* happy path sample workflow, using local branches, with explanations for first time users of Git. See here for a worksheet with useful git commands and their uses and a sample workflow. This covers only what this post covers. You will aslo see references here to “git tf”. This is not an alias but a cross-platform, command line tools that facilitate sharing of changes between TFS and Git. The commands are the same as the regular Git ones. But slightly different for pushing and pulling. See here for more information. Make sure you are happy with them and want to integrate them back into the main repo. Now broken down into the Git steps to achieve the above. Make sure you are on master. Use git status to check. 2. Create a new branch for your story work. If you do a git status now you will see you are on your new branch. 3. This is where you code as normal, running your tests etc. 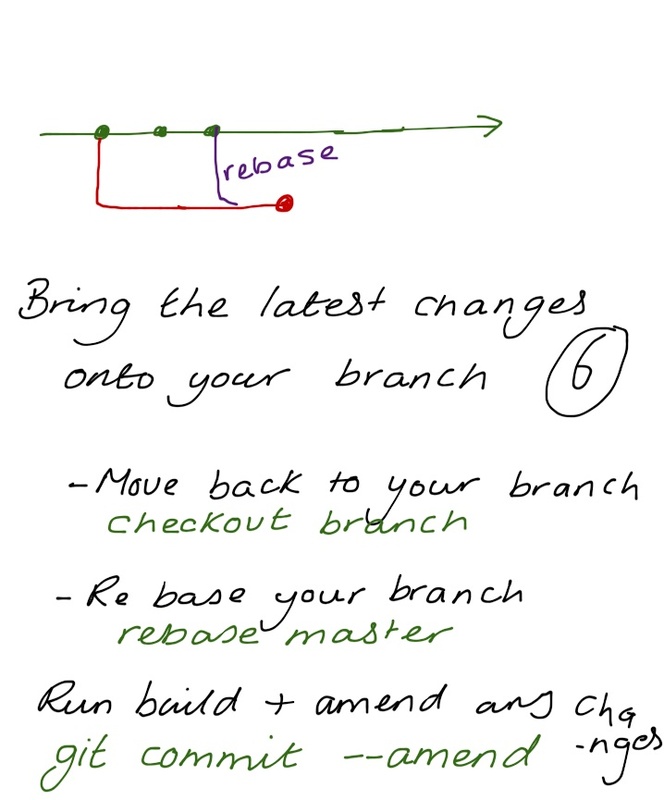 4.Commit your changes to your branch. When you are a point where you are happy with your changes and you want to pull in everyone else’s changes… You can commit as many times as you like to one branch but try to keep them small and in a working state. 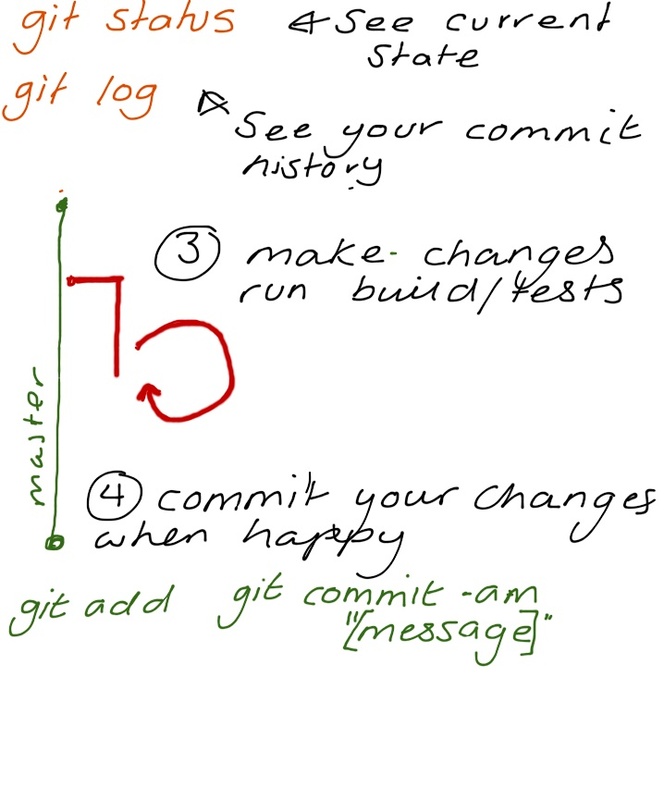 A git status will show you your changes. You will see the files that git is tracking and has staged and those that it has not. git add . Or git add -A will add any untracked files. Next commit your files to your branch. git commit -am "[message]"
When you do a git status now, you should see no changes. If you do a git log you will see that your commit is now part of the branches history. 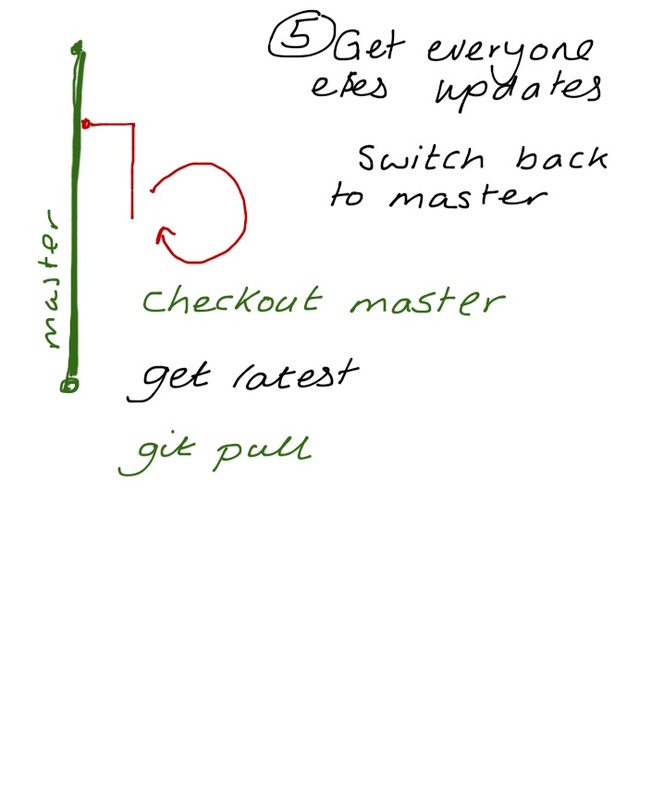 If you do a git log at this point, you will notice that your commit is not yet on master, and the latest commit will be from when you last pulled. 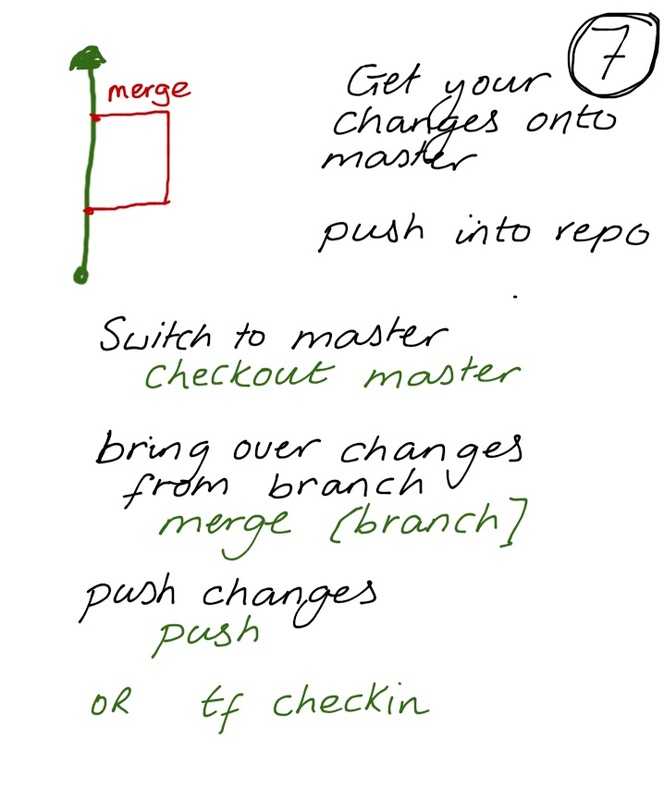 git pull will bring down any more changes. Next you are going to rebase your branch. 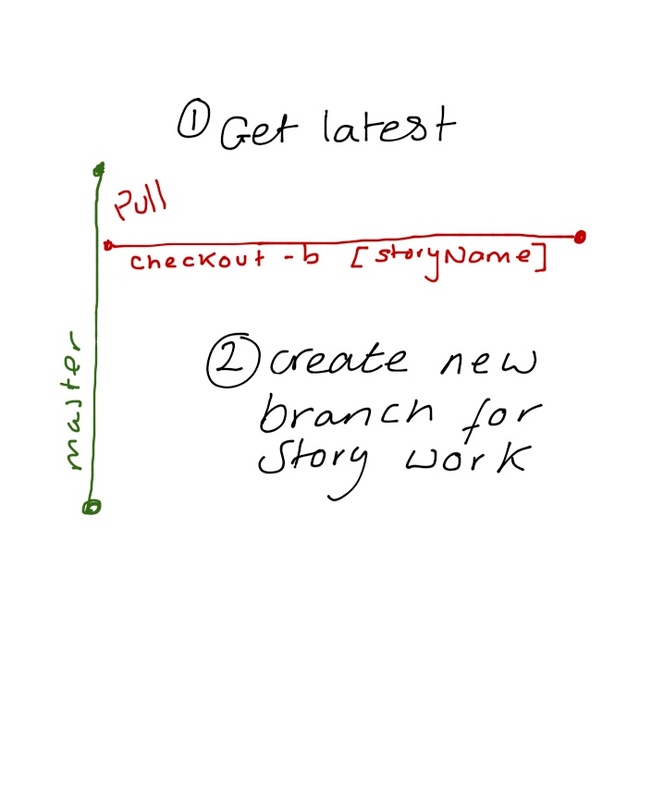 When you originally created your branch it was based on point in time x, since there have been additional changes (time y), you want to tell your branch that you actually want it to be based from time y and you want your changes on top of that. So now git rebase master will update your branch with all the changes that are now in your master branch. As you watch the output you will see that git pulls out your change, fast forwards to time y and then replays your change on the top. Now you may have conflicts at this point if two people have changed the same thing but will assume things are all good. Now run your tests and make sure everything is good. 7. Get your changes back into the main repo. git push will then send up changes to the remote repository. If you do `git branch –no-ff my_awesome_fix` then any commits you have made during the development of the branch get kept, which is useful when working in teams or wanting to see a detailed history of the project. That should be `git merge –no-ff my_awesome_fix` sorry.